Extra virgin olive oil is actually a lot like wine with a range of flavors. Different olives, different growing regions, and harvest timing are just a few things that will affect the flavor. When choosing an extra virgin olive oil, you should consider the flavor of the oil, NOT the color. 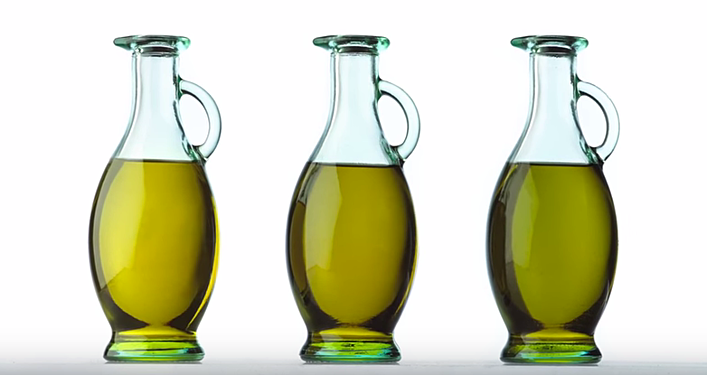 A greener-looking oil is not necessarily better, and good extra virgin olive oils range in color from golden to green. The myth that you CAN’T cook with olive oil couldn’t be further from the truth. Today we’re making a frittata with olive oil instead of butter. Replacing butter with olive oil reduces the saturated fat and cholesterol in recipes. You can easily swap olive oil for butter in many recipes – just use the conversion chart available from the NAOOA online. Although some of the flavor will diminish with extended heat, the smoke point range for olive oils is easily above the 350 degree average temperature of most home stovetop cooking. And, since olive oils are mostly made of monounsaturated fats, they are actually MORE stable when heated than many other common cooking oils. Olive oils are great for roasting too, they help lock in the natural moisture of foods, and they enhance the flavor of vegetables, like the asparagus and tomatoes we’re using in the frittata today. When used in baking, olive oil produces light, fluffy baked goods that stay fresh and moist longer. I used extra virgin olive oil for a savory effect in this spice cake. If you don’t want to change the flavor when baking, use olive oil instead of extra virgin olive oil. For example, I used olive oil in the strawberry sauce so the fruit and Grand Marnier can really shine. Just remember, unlike wine, olive oil does NOT get better with age. Always store your olive oil in a cool dark place, and use up open bottles within a few months.